The coming week will be a test of nerves for competitors hoping to make the Olympic Games. The Oceania Qualification Event begins on the 5th of March and will be staged in Sydne, in the heart of Australia. Top players from each of the contending Oceania nations will be present to compete, though as is usually the case, the clash of the two Oceania giants, Australia and New Zealand will be the main event. With just 3 places for male contenders and 3 respective places for female players, the Oceania Olympics Qualification Tournament is going to be a battle for the top spots. The major contenders have somewhat changed from my previous post. With some NZ players opting not to compete in the tournament, it is left for top ranked NZ male and semifinalist at last year's Oceania Cup, Phillip Xiao to lead the pack. Joining him will be Yi-Sien Lin, a former NZ rep and top 10 ranked player, and also Matthew Ball who represented NZ at the Australian Open last year and is also ranked in the top 10 in NZ. The three will face a tough opposition from Australia who had a big trial competition of their own to see which 4 players would proceed to the Oceania Qualifiers. With tough matches all over it was William Henzell who emerged on top at the end of the Australian Olympic Qualification tournament. Along with him was fellow TTEdge co-founder Robert Frank. A great finish for the two. Henzell had some tough moments with Justin Han who he beat 11-9 in the 7th and final set. Han qualified in the 4th spot, while the 3rd placing went to David Powell. This means Simon Gerada won't be competing in the Oceania Qualifier. The women's will be a spectacle in itself. Rumours circulating are finally put to rest with TTNZ announcing it's 1 woman contingent for the Oceania Qualifier. Li Chunli will go head to head with the best in Australia in what promises to be a nailbiter. If Chunli is well prepared we could well expect her to go all the way in the tournament. 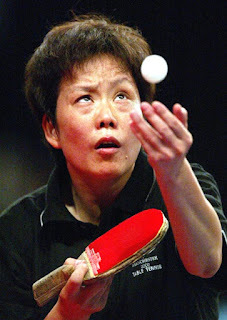 The former Commonwealth Champion also placed 3rd at the prestigious World Cup event in 1997, on the way to these fantastic finishes in both events she beat WR 14 Li Jiawei, WR 11 Ryu Ji Hye, WR 17 Tong Feiming, WR 15 Chai Po Wa and WR 8 Geng Lijuan and also WR 2 Li Ju from China at the 1998 World Cup. These results earned her reputation as NZ's greatest ever female player, those and her successive 9 time NZ women's championship titles. Chunli will face Miao Miao, Vivian Tan and Jian Fang Lay of Australia, the nations experienced top female players. The event promises to be a fantastic one, the usual atmosphere of Olympic Competition will capture the best fighting spirit from all the contending athletes and we will be sure to see some fantastic table tennis matches and some great results!